Sequence Set is an Apache Kahadb class. We use SequenceSet to track range of long values. 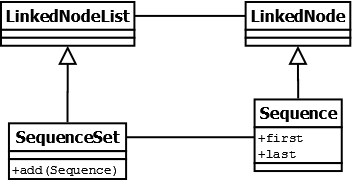 It is a Linked List consisting sequence ranges. If the new sequence finds an adjacent sequence either to the first or last of the sequence value, the sequence grows. Internally it adds a sequence of value 9 and then increments the last value from 9 to 12. Since 14 > 12 (head node’s last value), it adds after the head node. Since 4 < 9 (head node’s first value), it adds before head node and replaces it as head. Adds 8 first. Since 8 is adjacent to the head node’s last value (7), it simply grows the head’s last value to 8 so head node’s sequence value becomes 4-8. Also, now it finds the next sequence adjacent to head, so the sequence grows further to 12. 15 and 16 are already contained by the node 14-17 so the structure remains as it is.